The ‘Orchestra di ‘Roma’ has performed countless times all over Italy and abroad, and many of our concerts have been filmed and broadcasted by television networks like RAIDUE and RAITRE. We have also performed film soundtracks in concert and accompanied well-known pop musicians. Our programmes span symphonic and chamber repertories from the 18th – 20th century, with special attention given to new musical languages. 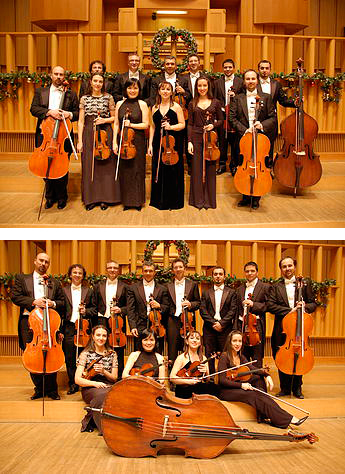 In particular, the string ensemble ‘Orchestra of Rome’ which specializes in baroque and classical repertoire has toured numerous times in Italy , France, Holland, Spain, America and the United Arab Emirates. It has also performed over 70 concerts in Japan in their most important concert halls, including the Tokyo Opera City Concert Hall and the Yokohama Minato Mirai Hall (Tokyo). In addition, we have performed at the Olympia in Paris, the Teatro Real in Madrid, the Teatro Regioin Turin, the Auditorium Pio dell’Accademia Nazionale di Santa Cecilia and the Umbria Jazz Festival. We have held over 50 concerts within various tournees at the Teatro Massimo (Palermo). The ‘Orchestra di Roma’ collaborates with musicians from the most prestigious Italian orchestras such as the Teatro dell’Opera di Roma, Accademia Nazionale di Santa Cecilia , La Scala Theatre in Milan, the Teatro La Fenice in Venice, etc.